Virgin Voyages has really overdone it by announcing the second Virgin cruise ship will offer exclusive private jet transfers 😉. This VIP service will be available for those guests booked in RockStar Suites, you can find more details about these modern cabins options right here. Guest will truly feel like rockstars once they arrive at the ship via Virgin Voyages’very own jet! They will have early access to all the ship features including entertainment and dining. A dedicate wardrobe team will even help RockStar guests unpack and pack, just think of it as a personal entourage. The team will also complimentary pressing service and nightly express swimsuit drying service. All the yet to be named second Virgin cruise ship needs is a runway across the very top deck for the private jet to land and take off but with Richard Branson’s Virgin Voyages anything is possible. Now if only today wasn’t April Fools Day! With Virgin, there is no limit and sister company Virgin Galactic is even planning on taking people to space, just think what a Virgin cruise ship could offer in the future. Possibly space launches for VIP guests direct from the open deck or how about the entire vessel being able to go underwater or fly? Some ideas for next years April Fools! The cruise line based in Florida will welcome its first ever cruise ship which is currently under construction by Fincantieri in Genoa, Italy. Scarlet Lady will be for adults-only with many industry first experiences. Once completed, Scarlet Lady will be 110,000 gross tons with a passenger capacity of 2,770 and enter service in 2020. She will sail a range of Caribbean cruises from Miami, Florida including calls at Costa Maya, Dominican Republic, Cuba, and Bimini. 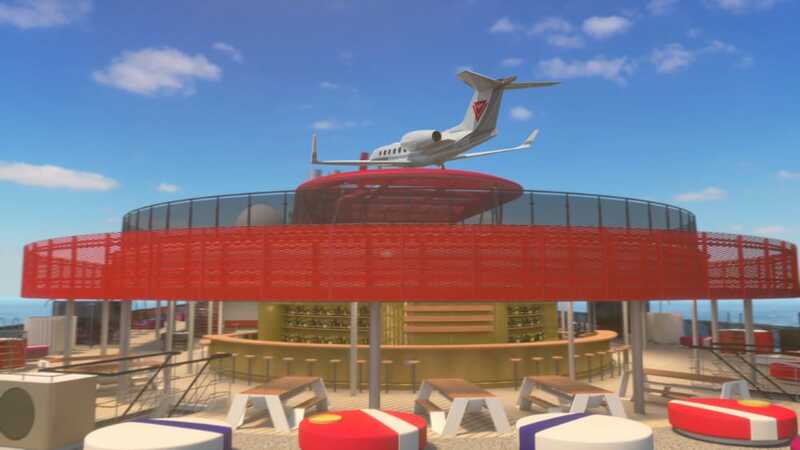 Virgin Voyages has announced that Scarlet Lady will feature a record store along with a karaoke studio and a DJ residency program. The hype of the first ever Virgin Voyages cruise ship continues with the release of shiny new video rendering of Scarlet Lady. Virgin Voyages has revealed "The Beach Club" located on Bimini island in the Bahamas which Scarlet Lady will sail to when she enters service in 2020.